Montebello Castle is a 15th century castle that houses a small museum and also offers stunning views of the surrounding areas. This castle is surrounded by deep moats that protects the castle’s walls. The castle was constructed in multiple stages which is evident from its walls. There is a little chapel here that is dedicated to Saint Michael. Also present here is the Archaeological and Civic Museum that opened in 1974. This museum is divided into two sections, history and archaeology. Personalize your visit to the city by chalking out a plan using Bellinzona trip planner. Oomph up your visit by adding the best hotels in Bellinzona like Leone Nero Hotel E Ristorante, Movenpick Albergo Benjaminn, Hotel Cereda and Fattoria L'amorosa. Curated Bellinzona vacation packages await! Book the best ones and start turning your dream into reality.Discover various ways for how to reach Bellinzona and complete the booking by choosing your mode of transport. Love this? Explore the entire list of places to visit in Bellinzona before you plan your trip. Fancy a good night's sleep after a tiring day? Check out where to stay in Bellinzona and book an accommodation of your choice. Wonderful castle with a great view over the whole valley. The castle was in a great condition and you really can imagine the mid age. The short but steep way up was a great workout after the yummy “italian” food in the city. 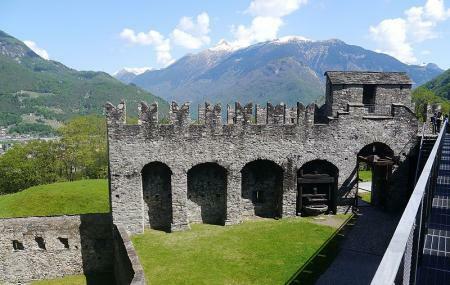 Beautiful castle with one of the best views of castle grande and Bellinzona city. There are a few stairs that one has to climb reach there and the entrance was initially difficult to find. But eventually, the view was all worth it. When we went there ( September and December) the museums were closed. My favourite of the 3 Bellinzona castles to visit. It's got a great view of Castelgrande, and has one of those "Grand Tour of Switzerland" shields that people like taking their photos with. It's the most beautiful of all 3 castles in Bellinzona. Great views from the top.